Less than a month after their last big progressive jackpot winner, the Slotland jackpot has already been hit again. 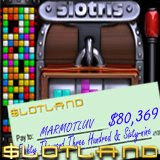 A player known as MARMOTLUV won $80,369 playing one of Slotland’s newer online slot machines, the Slotris. Slotris, a Tetris-like online slot machine that launched last year, is two games in one, both inspired by the popular game of falling-blocks considered by some to be the best video game ever. The wheels on the Slotris online slot machine spin the familiar multi-coloured cubes and the same squares fall into place on the grid of the adjacent bonus game puzzle -- just like the video game that has mesmerized millions for decades. There are two ways to win Slotris. There’s a traditional three-wheel single payline slot line with spinning symbols – coloured blocks rather than cherries. When three matching symbols line up, the player wins. But the coloured boxes don’t just spin on the slot machine wheels. Afterward, the same symbols fall into place in the grid beside the slot machine. Players can win this bonus game by guiding the blocks into place. Every solid-colour line multiplies the player’s bet and ten lines wins the jackpot. In August Slotland will introduce another new slot machine. The “Reel Riot” is a single payline slot machine with a “Double Wild” bonus symbol and a special “hold” feature that strategic slots players will love. The jackpot at Slotland is currently over $64,000. Meanwhile at Slotland’s 3D casino, WinADay.com, the jackpot is over $130,000 and many players believe it is overdue for a win.